From time immemorial, boat racing has appeared in Viet Nam. It is not only a competition but also a ritual in honour of the Water God, stemming from the act of praying for water among agricluture-based people. In some places there are only two boats in competition (in Ðào Xá, Phú Tho), a male boat with the figure of a bird at its head and a female one decorating with a figure of a fish. These two figures symbolize the yin-yang harmony (bird: in the sky – yang, fish: in the water – yin). The movements of the ores waken up the Water God. This kind of boat racing only takes place at night and ends at the crack of dawn. For fishermen boat racing conveys their wishes for bumper fish catches. In other places, boat racing is held to honour general who were good at navy operation. 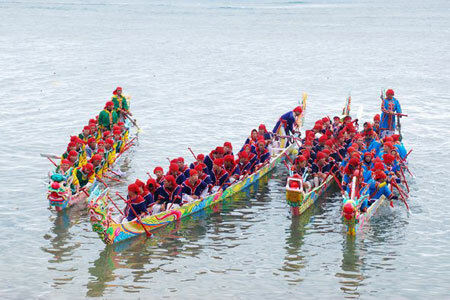 At present boat racing constitutes an important part in the program of many festivals from the North to the South, especially the localities with rivers and lakes or near the sea. It has gone beyond a belief activity to become a fascinating sport event, which attracts a large number of participants. As such, boat racing has become an event to compete and display collective strength.